Liquitex is the only one varnish we know to give good results on inkjet prints on paper. Varnish. The only one varnish efficient for inkjet prints is Liquitex. It does not solve the ink. Once a layer laid, the paper sheet is waterproof. (Rather expensive). 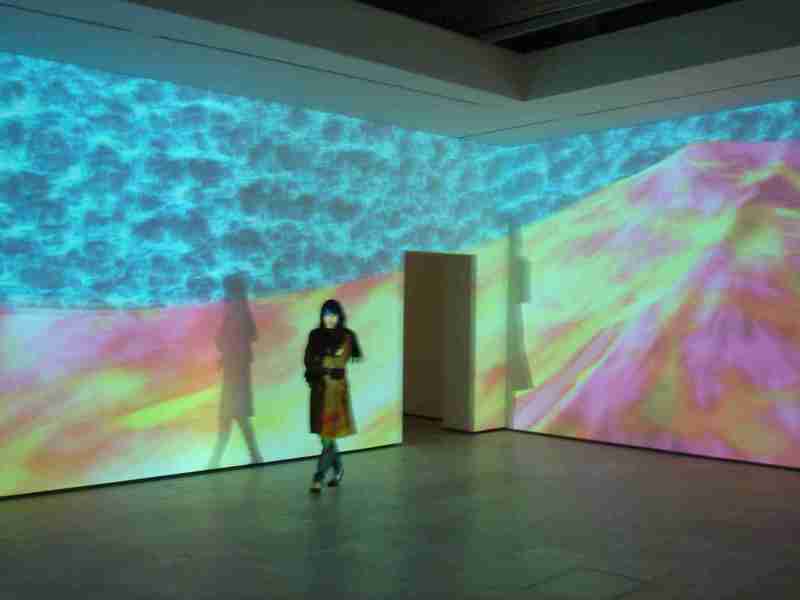 The wreck of the Dumaru, video art by Jennifer Steinkamp on the Chelsea gallery website. Vector, vectorial. [Agoston], [Foley], [Gonzalez], [Processing], [Photoshop]. - Breaking the pixel barrier. by Tobias Isenberg, M. Sheelag T. Carpendale and Mario Costa Sousa. 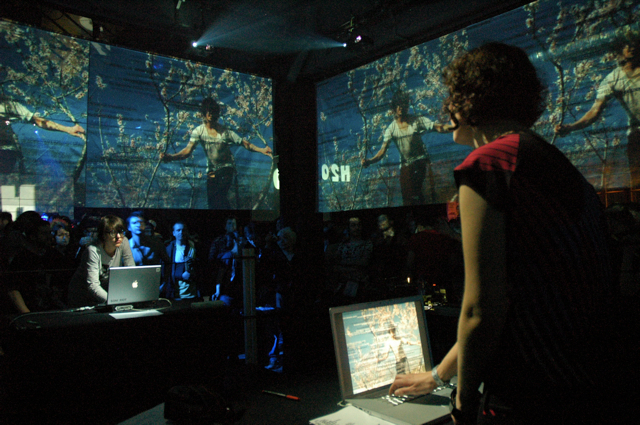 Communication at Computational Aesthetics 2005. - In synthetic music, speed of key push on and off. See for instance Cubase, by Thierry Demougin et Eric Chautrand, Campus Press 2002). Vibrato. A kind of texture in music. Frequently used with violin. In organs, some kind of vibrato is simulated as "human voice", playing on slightly difference of tuning on two registers. A primitive form of "synthesis". Video., and video art. See notice. - Video mapping. 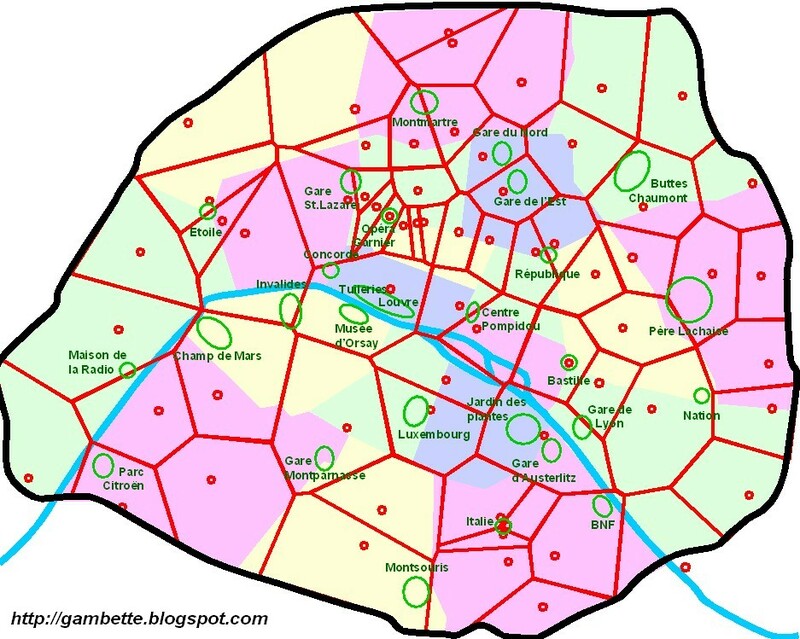 See mapping. View, viewpoint (vue). [Kemp], [Foley]. Viral art, virus. Art using algorithms inspired by viruses, for example "eating" a work. - Video of Viral Venture event, by Joseph Nechvatal (February 2011). 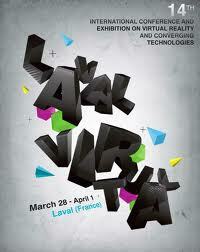 Laval Virtual, an annual summit of virtual reality. Virtual, virtual reality. See specific notice. - AR stands for Augmented raeality. VR for virtuality. - Visceral mobile music systems. by Atau Tanaka. 15 pages in [Adams]. Vision. See OpenCV, perception, glasses. < Computer Vision, Imaging and Computer Graphics – Theory and Applications, by by Ana Paula Cláudio , Dominique Bechmann , Paul Richard , Takehiko Yamaguchi , Lars Linsen , Alexandru Telea , Francisco Imai , Alain Tremea. of Communications in Computer and Information Science, Volume 983, 2019. Available on the SpringerLink web site . < Computer Vision, Imaging and Computer Graphics - Theory and Applications by Sebastiano Battiato , Sabine Coquillart , Julien Pettré , Robert S. Laramee , Andreas Kerren , José Braz . Communications in Computer and Information Science . Volume 550. Sprnger 2016. < Computer Vision and Graphics, by Leszek J. Chmielewski , Ryszard Kozera , Bok-Suk Shin , Konrad Wojciechowski. Lecture notes in Computer sciences. Springer 2014. < Computer Vision – ECCV 2014 by David Fleet , Tomas Pajdla , Bernt Schiele , Tinne Tuytelaars. Lecture notes on computer sciences, volumes 8689 to 8695, Springer 2014. < Computer Vision Systems by Mei Chen, Bastian Leibe, Bernd Neumann. Lecture Notes in Computer Science. Volume 7963. Springer 2013. < Computer Vision, Imaging and Computer Graphics. Theory and Application by Gabriela Csurka, Martin Kraus, Robert S. Laramee, Paul Richard, José Braz Communications in Computer and Information Science. Volume 359, Springer 2013. < Computer Vision - ACCV 2012 Workshops by Jong-Il Park, Junmo Kim. Lecture Notes in Computer Science. Volume 7729. Springer 2013. < Computer Vision – ACCV 2012 by Kyoung Mu Lee, Yasuyuki Matsushita, James M. Rehg, Zhanyi Hu. Lecture Notes in Computer Science. Volume 7727. Springer 2013. < Computer Vision – ACCV 2012 by Kyoung Mu Lee, Yasuyuki Matsushita, James M. Rehg, Zhanyi Hu. Lecture Notes in Computer Science. Volume 7725. Springer 2013. < Computer Vision and Graphics by Leonard Bolc, Ryszard Tadeusiewicz, Leszek J. Chmielewski, Konrad Wojciechowsk. LNCS volume 7594. Springer 2012. < Making things See. 3D vision with Kinect, Processing, Arduino, and MakerBot. by Greg Borenstein. Maker Media, 2012. < Machine Vision, Theory, Algorithms, Practicalities (Signal Processing and its Applications) by E. R. Davies. Electronic book by Google. Paper edition also. < Computer Vision – ACCV 2010 Workshops by Reinhard Koch, Fay Huang. LNCS (Lecture notes on computer sciences) Volume 6468. Springer, c. 2010. < Computer Vision – ACCV 2010 Workshops by Reinhard Koch, Fay Huang. LNCS (Lecture notes on computer sciences) Volume 6469. Springer, c. 2010. < Seeing. by John Frisby and James Stone. MIT Press 2010 (2d édition). - One of the topics dealt with by [Bres]. - Recent research at MIT (notably on peripheral vision) 1/2011. - See Kinect in proper nouns). - Theory and programming [Kemp], [Breazeal], [Foley], [Siarry], [Gazzaniga], [Open CV]. - Interview of Frédéric Truchetet AH No 109. < ICVS 2002 Proceedings AH No 107 (concepts). < Vision stéréoscopique et perception multisensorielle. by Nicolas Ayache. Interéditions 1989. < Visual processing. Computational, psychophysical and cognitive research. by Roger Watt. LEA. Lawrence Erlbaum Associates, Publishers. Hove and London UK, Hillsdale USA. 1988. < Vision. by David Marr. The first edition, 1983, was a breakthrough. - "In filmmaking, visual effects (abbreviated VFX) are the processes by which imagery is created and/or manipulated outside the context of a live action shot." (Wikipedia). - In the context of film and television production, a visual effects supervisor is responsible for achieving the creative aims of the director and/or producers through the use of visual effects. (Wikipedia). VJing: Laptopsrus at Mappins-VJing festival, Geneva, a VJ solo show by Raquel Meyers. Visualization, visual. See interaction ,illustration, infography. - Visualization is the representation of abstract data, in order to enhance its comprehension. It may be interactive, thinks Ivan Viola. < The functional art. An introduction to information graphics and visualization. by Alberto Cairo. : New Riders, Berkeley (CA) 2013. - Illustrative visualization. An IEEE tutorial ,192 pages (A4 on two columns), free downloadable (PDF). Authors: Ivan Viola, Meister Eduard Gröller, Markus Hadwiger, Katja Bühler, Bernhard Preim, Mario Costa Sousa, David Ebert, Don Stredney. - Advances in Visual Computing by George Bebis, Richard Boyle, Bahram Parvin, Darko Koracin, Charless Fowlkes, Sen Wang, Min-Hyung Choi, Stephan Mantler, Jürgen Schulze, Daniel Acevedo, Klaus Mueller, Michael Papka. LNCS Volume 7431 and 7432. Springer 2012. - Design principles for visual communication. by Manesth Agrawala, Wilmot Li and Floraine Berthouzoz. Communications of the ACM. April 2011. - Smart visibility in visualization. by I. Viola and M.E. Gröller. Computational Aesthetics symposium, 2005. Available to subscribers of ACM on line library. " One approach is importance-driven feature enhancement, where the visibility of a particular feature is determined according to assigned importance information." - Recherche d'information par le contenu visuel. Special issue of RSTI. Technique et science informatique. 9/2003. Nozha Boujemaa Frédéric Jurie eds. Hermès/Lavoisier 2004. VJ, VJing. Vidéo-jockey. See notice. - rendering by isosurfaces, see a communication by Markus Hadwiger (18 pages ) in the IEEE tutorial. Voronoi. Diagramm or transform. Dealt at large by [Cocquerez]. Vowels. See Arthur Rimbaud's verse. VRML. Virtual reality modeling language. - VRML 2.0 Source book, by Andra Ames, David Nadeau et John Moreland, Wiley and Sons 1997.